The list below contains the range of courses offered for various degree programmes. Many of the courses are available as stand-alone options for which you receive a certificate once the course is completed and passed. This means you do not have to register for a full degree. Subject to certain rules, up to two certificates can be turned into credits for an Honours degree, provided you are accepted for that degree. Classes take place either once a week in the evenings over 12-14 weeks, or as full-time courses for 1-2 weeks. What you need to earn a certificate: Attend the course and fulfil the assessment requirements to receive a Wits University Certificate of Competence. If you are accepted into Honours at a later point, you can apply for up to two of these courses to be credited towards your degree. When to apply: At least one month before the start of a course. These courses do not run every year, depending on demand and the availability of teachers. Please note that entry to all courses is subject to the agreement of the course coordinator since some courses may require minimum levels of previous experience. Please see the 2019 timetable for course days and times. Find out more about the Wits Radio Academy’s certificate courses and Development Communication Certificates. This course is designed for communicators in government, private or NGO sectors, or anyone who would like to learn the basic skills of journalism. These include news judgment, newswriting, interviewing, research, ethics and some basic skills to promote pro-active, strategic communication. Weekly seminars. Co-ordinator is Enoch Sithole, enochs@live.co.za . This course is available for masters and honours, as well as for certificates. Presented in conjunction with the Wits Law School, this is an intensive look at the law and ethics affecting our profession. It equips participants with the skills needed to deal with difficult situations that may arise in newsrooms and is ideal for a journalist in need of a thorough update. Weekly seminars. Co-ordinator is Adj Prof. Franz Kruger, fkr@mweb.co.za. This course is available for masters and honours, as well as for certificates. South Africa has a rich tradition of narrative accounts stretching back in the case of the Bleek-Lloyd archive to hunter-gatherer times. There is also no shortage of works written by visitors such as mercantilist Jan van Riebeeck, scientist-explorers, missionaries, and, in more recent times, journalists such as Sol Plaatje, Nat Nakasa, Noni Jabavua and Bessie Head. The chosen texts aim to showcase compelling storytelling and to understand the authors in the political-economic context of their times. This course will examine and dissect writings by these authors in the context of present debate and discussion around decolonisation and develop the African narrative. 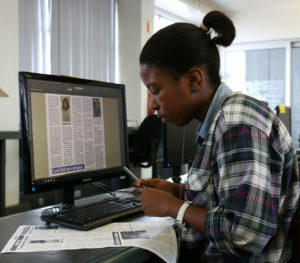 Students will also examine the techniques of creative writing, a form sometimes called literary journalism. They will be required to produce their own long-form story or essay which contributes to the South African narrative. Evening class: Mondays 5 to 7, first semester. This course is for those who want to specialize or any journalist who wants to conquer the language of business and finance. At the end of the course, journalists should understand basic principles/techniques of how to cover the economy with a focus on fiscal and monetary policy, companies, the equities and commodities markets. They should have mastered writing on technical subjects clearly and without jargon. They should have a particular understanding of reporting the Reserve Bank and the National Treasury. They should also have basic skills to cover markets and general business. This course can be followed by our Advanced Financial Journalism course. Inquiries: Kevin Davie Kevin.Davie@Wits.ac.za. Read more about three courses in financial journalism. This course is available for masters and honours, as well as for certificates. This course is available for masters and honours, as well as for certificates. The course aims to introduce students to the study of radio and audio and to consider their changing shape and social impact. It will analyse critically the way a range of contextual factors – including politics, history, culture, language, technology and others – impact on radio as medium and industry. It will probe its place in the media ecology, both in SA and other countries, and its role as the public sphere. Students will engage with debates and options for different kinds of regulatory frameworks that balance economic issues and the public interest and will be able to critically analyse debates and controversies around radio, as well as possibilities for its future trajectory. There will be a particular emphasis on the growth and impact of new media, and the course will also expose students to the range of genre and format possibilities of the medium, and consider the aesthetic of audio. The course is offered on a blended basis: a face-to-face component (an introductory two-and-a-half day seminar); online work and a few short seminars that can be attended via Skype, and a final face-to-face seminar of one day. The coordinator is Adj Prof Franz Krüger franz.kruger@wits.ac.za. This course is available for masters and honours, as well as for certificates. The investigative journalism course can be taken as a short course or as part of a Masters. The course is led by experienced professionals. This course will take you through the history, ethics, tools and practice of investigative reporting. It includes data journalism, research, storytelling, planning and organising your investigation and using access to information laws. Participants will undertake an investigation as part of the course. Students can take our MA in Journalism and Media Studies (Investigative Reporting). The course requirements are to study Reading the Media (core MA course), the course in Investigative Journalism (outlined above), one other course of choice, and a Research Report related to Investigative Reporting. Data Journalism (Journalism Special Topic): This is an introduction to the cutting edge of computer-assisted reporting. Students will do their own data-driven project, learning the necessary skills along the way. This will include finding publicly available date, identify the data-based story, cleaning and verifying data sets, using spreadsheets, data visualisations and how to bring the story to life. Students will be mentored by award-winning data journalists. Co-ordinator is Anton Harber. Applications and queries: journinfo@wits.ac.za.